← [Sales] 70% discount in permanent shops and player shops ! Under the stars, fairies partake in a twirling celestial dance. A chassé-croisé of love with wonderful colors takes you to a gripping world rich in magic. This LookBook offers you to rediscover the famous theater play of the same name in an original and new setting. Impossible not to give way to the characters of this comedy ! Collect different looks to unlock the following stage ! 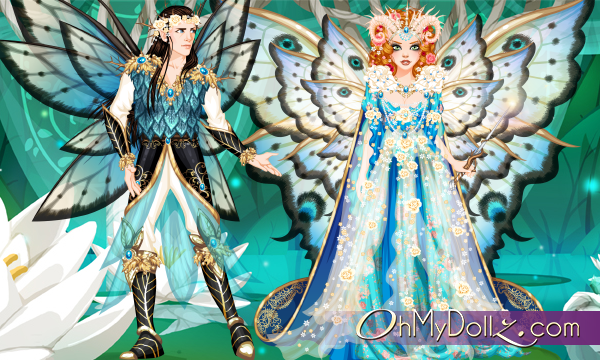 And to obtain the ultimate look – Titania, Queen of fairies – its new model, its husband Oberon and the Fairy Palace, you will need to collect every look. This look additionally contains a new model, the character of Oberon and the room “Fairy Palace” (or its extension if you already own it) ! If you already have the extension of the room, you will receive 15 item multipliers ! Will you prove yourself as a true fashionista on OhMyDollz ?